Learn how to grow poppies in this article. 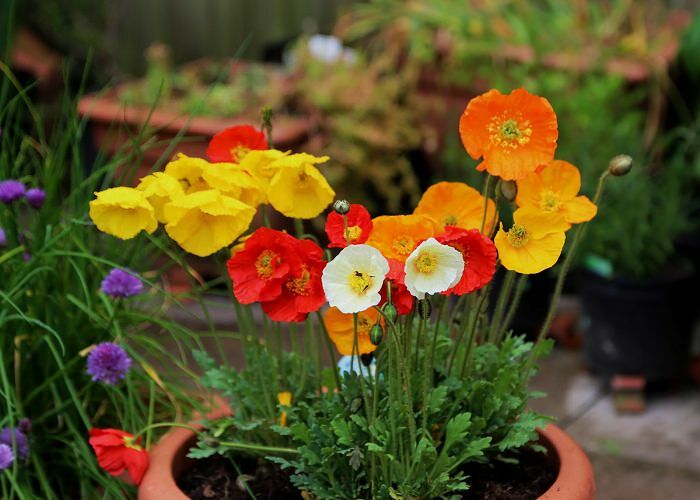 Even if you don’t have a space for large flower beds, by growing poppies in pots you can still enjoy the colorful blooms of this stately flowering plant. 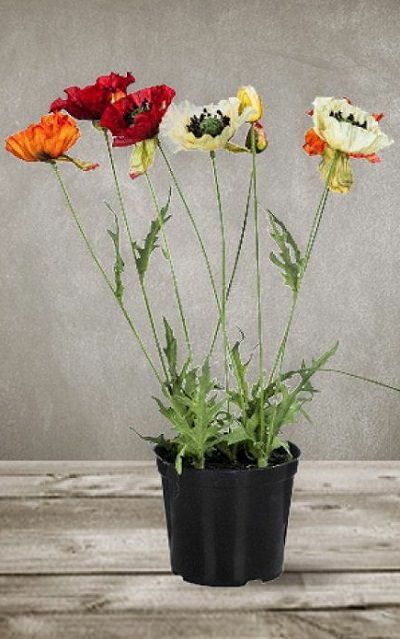 Beautiful and seemingly delicate, the poppies are the plants not particularly very easy to grow, but the beauty of the flowering plant makes it a popular classic. Those who want to enjoy the intense blooms in their container gardens must grow poppies in pots. Most of the oriental poppy cultivars have large strikingly beautiful flowers that usually appears in late spring to early summer in bright colors like orange and red. There are also softer colors of this perennial flowering plant: pink, white and purple, with or without a central spot. Height: 0.40 to 1.20 m.
Usually grown as an annual or biennial this short living perennial is self-seeding and comes year after year, does not like the hot summers. Lightly perfumed flowers appear from mid spring to mid summer in colors like yellow, orange, red, pink and white. Flowers of this cultivar fade slowly than other poppies. Height: 0.30 to 0.6 m.
The showy state flower of California is a short-lived perennial in warm temperate and subtropical climates (USDA Zone 8-10). If you want to grow poppy in a tropical climate, try California poppy, keeping the plant in partial shade in summer. Height: 0.15 to 0.45 m.
One of the most beautiful and delicate poppies. Shirley Poppy is the name given to an ornamental cultivar group derived from the European wild field poppy (Papaver rhoeas). USDA Zones: 3-9, can be grown in zones 10 & 11 as annual but doesn’t tolerate tropical heat well. Growing poppies in pots is easy; the plant is best grown in a medium sized pot. As poppies don’t tolerate waterlogged soil, ensure the pot has sufficient drainage holes in the bottom so that the water will drain freely. 1. Poppy grows well from seeds. Make sure that you place the pot in a bright position after planting seeds as poppy seeds require light to germinate. Also, most of the poppies do not like being transplanted, so either choose a pot that is biodegradable or plant seeds in the exact pot in which you wish to grow poppy plants later. 2. Disperse seeds by hand in the pot. As the poppy seeds are very small, gardeners often mix them with sand to achieve a more equitable distribution. This also helps to see where the seeds were sown. 3. Tamp the seeds lightly down on the soil so that they are covered by a very thin layer of soil or sand. This keeps the seeds in place, and they’ll also get plenty of light for germination. Once the seeds are planted, moisten the soil making sure you don’t move the seeds. 4. Keep the soil constantly moist until germination. Germination depends on the climate and species but usually occurs within 25 days. 5. Poppies have a very delicate root system in the beginning so once the seedlings sprout water them gently. Thin out the seedlings 4-6 inches apart, when they reach a height of 5 inches. If you are planting in a medium to the large sized pot, you can easily keep more than one plant per pot. 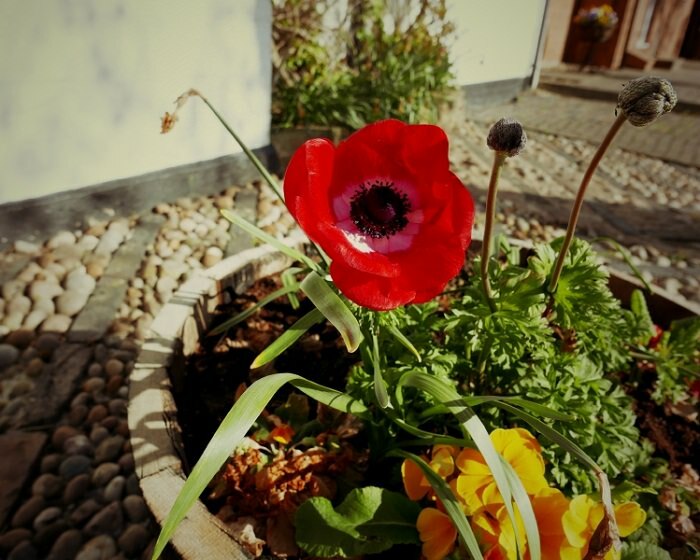 Poppies love the sun, so place your pots in a spot that receives ample sunlight, at least 6-7 hours daily. However, if you live in a warm climate where the sun is intense, grow poppies in partial sun. Poppies can thrive on a variety of soils unless it is clay rich and blocks the drainage, the best is to use humus rich, loamy potting mix. The substrate should be neither too loose, nor prone to compaction and must be well draining. Slightly acidic to neutral soil pH is recommended. When the poppies are in bloom or about to bloom in warm season, watering must be moderate and regular. On the contrary, once you get past the period of flowering, best to leave the soil dry as much as possible and watering must be done only when the top one inch surface of soil seems dry. Poppies are not heavy feeders; on the ground, they tolerate poor soil and thrive on their own, but when growing poppies in pots you’ll need to fertilize the plant. At the time of planting or at the beginning of growing season, usually, spring (fall in warm frost-free climates), add a slow-release fertilizer to provide a steady supply of nutrition to plant during the whole season. If you haven’t added a slow release fertilizer, start to feed the plant with balanced liquid fertilizer on a bi-weekly basis once the plant has exceeded the height of 5 inches or when new growth emerges in spring. You can also feed the plant with flower fertilizer during the flowering period. Cease the application of fertilizer once the growing period ends. Also, poppies are prone to magnesium and iron deficiency, application of Epsom salt is recommended. Cut off the faded flowers to encourage more blooms. If the pot is not well draining or if you overwater the plant, it may die due to root rot. It also suffers from powdery mildew. In pests, keep an eye on aphids and spider mites. Is this legal? Aren’t poppies the source of morphine? Yes, poppies are the source of morphine. But it isn’t like you can make a batch of morphine in the kitchen. It requires specialized knowledge and equipment in addition to a HUGE crop of poppies to even be considered worthwhile for a person growing them for that reason. Anyway, yes, it’s legal to grow poppies. It is not legal to score the pods for purpose of ingesting them. Also, poppy seeds, the kind that you get on a poppy seed bun, come from these flowers and many home makers use them for their seeds. Many gardeners grow them in their garden for their bright, showy blooms. None of the poppies mentioned here are opium poppies. Those are called papaver somniferum, bread seed poppies or cabbage leaf poppies. And yes opium poppies are legal to grow.